^ Will that pave the way for an Innocent adaptation, I wonder? It's finally time for the next generation of super yuri mahou shoujos! That's pretty nice. Good to have Nanoha returning to the anime world. Would somewhat prefer the action you'd get in Force, but this will still have good moments. The problem with Force, of course, is that we get an idiot male MC slotted in. I think Innocent would have been better, if for Alicia. ALICIAAAAAAAAA! In any case, in commemoration! I think there were other problems with force, but let's not bring that up. This is a time to be happy. While I do agree, I'm afraid Innocent is a little too much of a "for big fans only" sort of thing. And don't forget the materials. Been a while since we had a TV anime for Nanoha, and Vivid makes an excellent choice in that regard. OH MY GOD I just pulled a Kid Dynomite when I saw this. Move over, Sailor Moon! Move over, Cardcaptor Sakura! Hell, every magical girl needs to get out of the way. The Nanoha girls are FINALLY coming back after a freaking dinosaur's age! Hmmm... one unusual thing about Vivid is that unlike the original, A's and StrikerS, this one will be adapting an already running pre-existing work, aka the manga. Can't wait to see the good Numbers animated. It's been 7 years since the last TV anime. Makes me wonder how far this is going to go. Especially since ViVid is still ongoing, and has only just recently gained a semblance of plot. If it does well enough, here's to hoping that we'll get a Force adaptation as well. Nanoha is back, baby! Seven Arcs is finally doing a new TV anime for Nanoha! I would have preferred a Force anime...but I'll take what I can get. What's that? 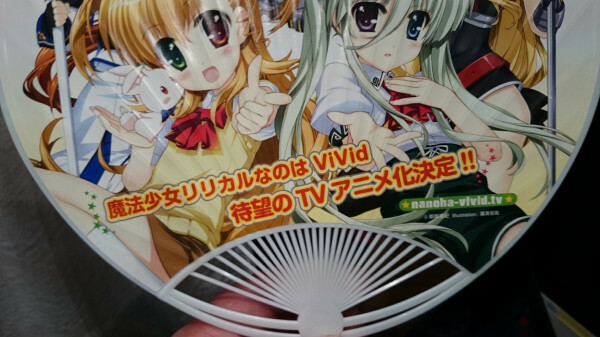 A new Nanoha TV anime? Has hell frozen over? I thought it was never going to happen at this rate. Not that I'm complaining. YAY. Ah well. Vivid was always more awesome in my head than in actuality. But then again, being able to venerate the Lord of Midchilda once more will be worth it. We'll probably get a Force anime eventually. For now, I'm happy with what we get. I haven't read that far into ViVid, but I liked what I read, so I'll be looking forward to this. Agree. Would not surprised me if it comes a year after Vivid. If Vivid does well rating wise. Yeah, glad to run with what we've got. Of course this does have a different feel to it since it is an adaptation. Instead of just running a single story will have to consider how far into the material they want to go. Damn, is this this best 10th Anniversary present ever!? Man, I'm so glad that Nanoha Vivid will be adapted into a TV Series! On the other hand, will Seven Arcs pave a way for Nanoha Force adaptation?